Limited amount of tickets to this exclusive event. The Vampyres are coming........and they're bringing cake! 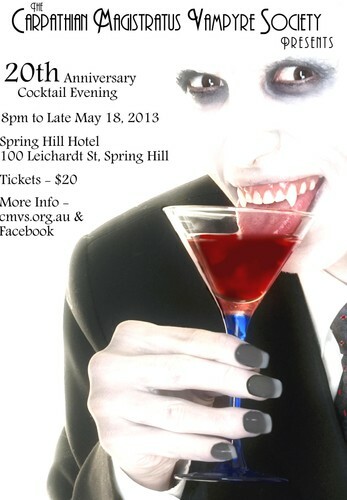 Come and celebrate the 20th anniversary of the Carpathian Magistratus Vampire Society runners of the BloodLust Ball if you dare! This is a formal occasion not quite BloodLust Ball standards but fang up and do look your most undeadest cocktail style. We will be opening up memberships on this most fangtastic of evenings and selling merchandise. All proceeds go towards the BloodLust Ball for this year. So drag yourself out of the coffin for this evening for some special guests and announcements for this years Bloodlust Ball. We'll have a few giveaways, local films and special guest dj's to help you dance in the darkness and cocktails to quench that undead dying thirst! Don't forget to order the CMVS special! Tickets available from Voodoo Lulu till 30th April, Underworld Realm and email cmvs1993@gmail.com.